A few creative approaches to help you bring in the moolah! The biggest mistake a performing arts organization can make is to be timid about its fundraising. So don't be timid. Be bold. You're providing something essential to the community, and you need money to operate. You can't get what you don't ask for. So ask. Be creative, charming and outgoing (without being pushy). Do so year-round, versus once a year. Make it fun, and you may just be surprised at what comes back to you. With this in mind, the following are twenty ideas that just may help you raise funds for your organization, and in a way that's actually fun for all involved. The next time you print up promotional posters, postcards, or window cards, be sure to save a few back, then have them signed by the entire cast! These items are great keepsakes, and make great items for auction. You can also do the same with T-shirts signed by the cast, as well. Make sure everyone uses permanent Sharpie markers, for longevity. Sell admission (by invitation only) to an exclusive, swanky cocktail party with the cast whose theme ties in with the show. Get RSVP's, see if you can get a caterer to donate food, and have the cast attend in full costume. If you can get the blessings of the appropriate designers, auction off sketches or signed computer-generated images of your costume designs, set designs, or light plots, all autographed by the designers themselves. Housecleaning or handyman services -- and more! Auction off a romantic evening created by your cast and crew! Join up with a local restaurant for the meal itself, then serve the meal on a beautifully appointed table on your stage, under the 'stars' and against a beautiful backdrop. Have select members of the cast 'serve' the happy couple and serenade them throughout the evening. Auction Off Those Hats and Canes! For dance groups involving a bit of glitz, like tap or jazz, for instance, auction signed tap shoes or taps, top hats, canes, scarves, or other jazzy accouterments. For ballet companies, auction off old pointe shoes from the principal dancers, and autographed by them. For a dramatic touch, mount the shoes on a doll stand before selling at auction. Sell a Free Dinner with the Cast. Auction off an intimate dinner with the leading actors after a show. Everyone loves the chance to meet and talk to performers! For symphonies, make shadowboxes of programs or concert posters, and incorporate everything from batons to cello or violin strings, and more into the pieces -- then auction them off at a premium. Don't forget to get special guests or principals to sign them! 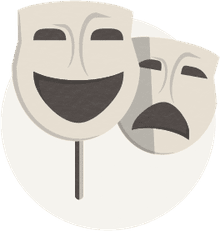 As a variation on the previous approach, if your storage or costume shop is overflowing with costumes, props, or set pieces, consider auctioning off certain set pieces or props, as well. Again, you could have these signed by designers or cast principals, depending on the items involved. Sell admission to your final dress rehearsal(s) at a reduced rate. Today's poor student is tomorrow's successful theatre patron. Team up with a local restaurant for a 'themed' night, at a special price per plate, with serenading performances by your cast throughout the meal. For symphonies or musical groups, collect old or broken (i.e., unplayable) instruments from musicians, then have them signed or painted by the musicians, and auction or raffle them off! It's a great and special way to add a bit of life to the instrument and turns it into a treasured keepsake. Patricia Conolly, Dana Ivey, Angela Lansbury and Paxton Whitehead perform a staged reading. Stage a highly publicized one-night-only (or one-weekend-only) reading, and sell tickets at a premium. Add a bit of glitz to the event by involving a local celeb or respected guest, even a local politician. Keep everything formal, beautifully set up, and elegant. Use barstools for the performers, not chairs. Light the reading creatively. And introduce and close the reading with reminders to donate and support the rest of your season. If you're a nonprofit, solicit donations of goods to sell or auction from local businesses, emphasizing that you'll promote their support in your PR campaign as well as in your programs for the year. Stage Benefit Concerts... Even in the Streets! While benefit concerts are a tried and true approach, you could take that a step further and offer smaller, isolated performances around town for donations, including soloists, duets, string quartets, and more. Always make sure the performers are clearly wearing T-shirts or sweatshirts with your organization name or logo -- every little bit of advertising helps! Get a business to offer a show sponsorship or donation if you get X number of Facebook fans... then get those fans! Do a variation of this on Twitter, promising some humorous but dire outcome if you don't reach the desired number of followers. Put your logo on an array of stuff at CafePress. It's free for a basic assortment (meaning a single image on everything available). Mark everything up to PREMIUM. Don't hesitate. You'll thank me. Then promote the heck out of it. Full disclosure -- We've run a CafePress store for five years, both in support of my theatrical enterprises, as well as to celebrate my love of pop culture and the performing arts. It's something that's easy, free (or nearly free), and a surprising revenue source if you promote it right. See if a local veteran's organization will sponsor your production of Mister Roberts -- or A Few Good Men! Some people want the best, and they're willing to pay for it! With this in mind, sell the two (or four, or six, etc.) best seats in the house at a premium, at auction. Sell them by the show, or by the season -- you'll be surprised how popular this option will turn out to be. You get the idea... Your fundraising possibilities are limited only by your creativity. Go forth, be creative -- then share your successes in our forums!